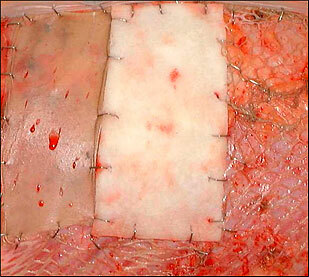 Hycail have developed a medical device material for efficient treatment of open wounds. The cellulose material has an insignificant level of residues and the structure of the material protects the wound from infection, cleans already infected wounds and stimulates formation of granulation tissue and induces revascularization of the wound. The material has the potential to reduce wound care costs by reducing treatment time, improve the number of successful treatment outcomes and reduce the need for use of expensive artificial skin substitute products. A product for treating 3rd degree burn wounds has been tested at the Helsinki University Central Hospital, Department of Plastic Surgery. The outcome of the study shows comparable or better results with our medical cellulose material than with an expensive artificial skin product. The target for European approval (CE) for a medical device class 2b is in late 2014 and we are looking for commercial partners.